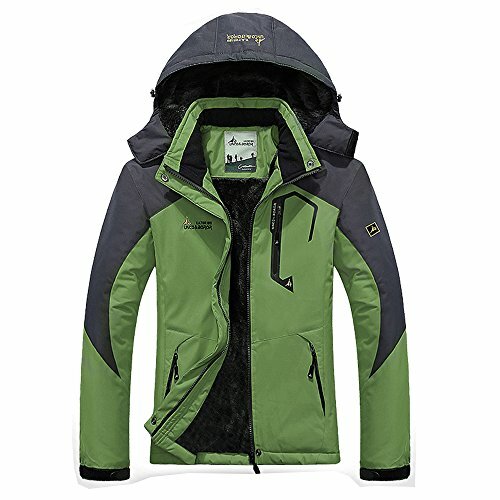 This is a windproof, waterproof, scratch proof warm ski jacket with multi pockets. The super soft fleece lining and cotton padding will make you warm during cold days. The waterproof coated fabric is suitable for rainy or misty weather. Unique design like elastic cuffs with stretchable thumb holes, windproof powder skirt, adjustable hood and hem can keep the wind out effectively. Please order China size per size measurement as below. Warm Fabric: Professional water repellent coated, high quality cashmere fabric which guarantees the best heat retention. Relaxed-fit style with quick-dry material. Windproof: Inside windproof snap powder skirt, internal drawcord hem, detachable and adjustable storm hood help to keep wind out. Wear resisting soft shell is highly wind resistant. Multi Pockets: 2 zippered hand pockets, 1 zippered chest pocket (passport or cards stowed), 1 sleeve pocket, 1 internal pocket, 1 internal secure media pocket. An earphone line fastening and supporting fixture available inside the jacket. If you have any questions about this product by CHUSANHI, contact us by completing and submitting the form below. If you are looking for a specif part number, please include it with your message.